$229.95 This may be in stock for quick delivery; please call! 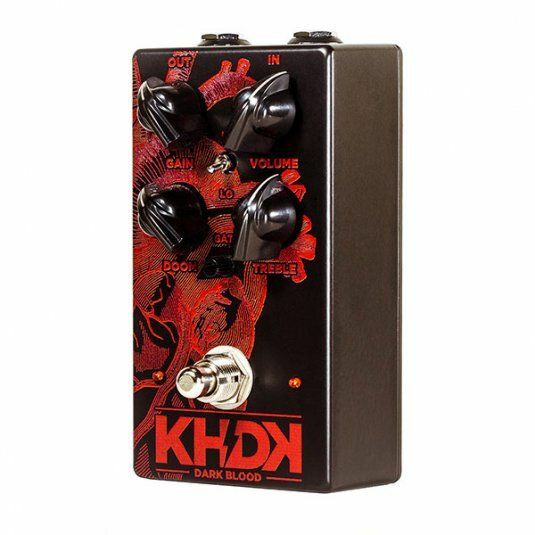 KHDK’s most evil pedal to date, Dark Blood delivers an angry, merciless amp-like distortion. The tone of Dark Blood is tube-like and mid-heavy with added high gain. It’s unique power is its distinctly amp-like sound. 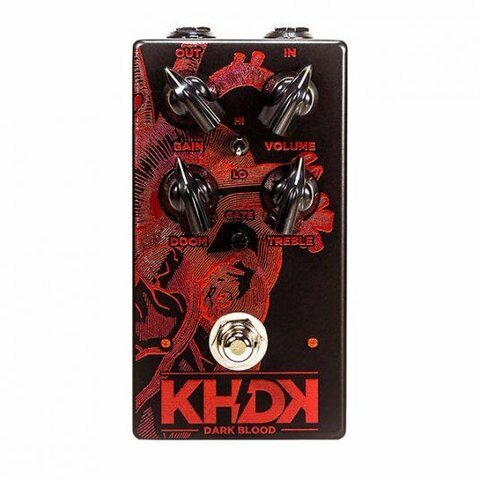 KHDK’s most evil pedal to date, Dark Blood delivers an angry, merciless amp-like distortion. The tone of Dark Blood is tube-like and mid-heavy with added high gain. It’s unique power is its distinctly amp-like sound. Richly articulate and deep, Dark Blood can provide the main tone into your clean amp and is ideal as a fly rig and a backup to an amp or modeling rig. With its high gain and aggressive, uncompromising dynamics, this is the ultimate pedal for gain-freaks, designed both for palm muting riffs and searing high gain solos. 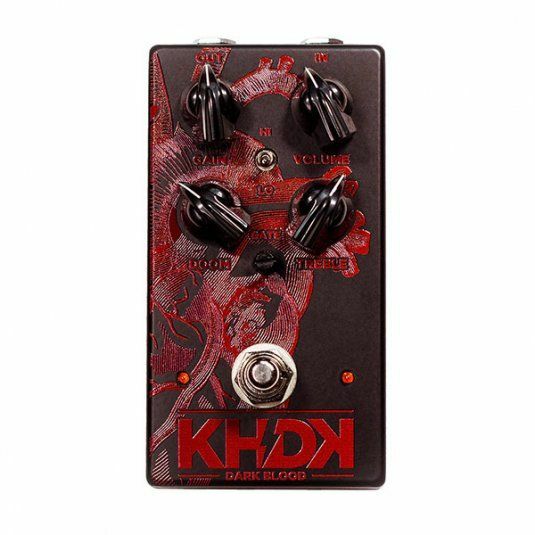 Dark Blood is built on KHDK’s original circuit combining solid state and mosfet technology. In classic metal fashion, a treble booster was added to the front end of the circuit to push your tone to the limit. 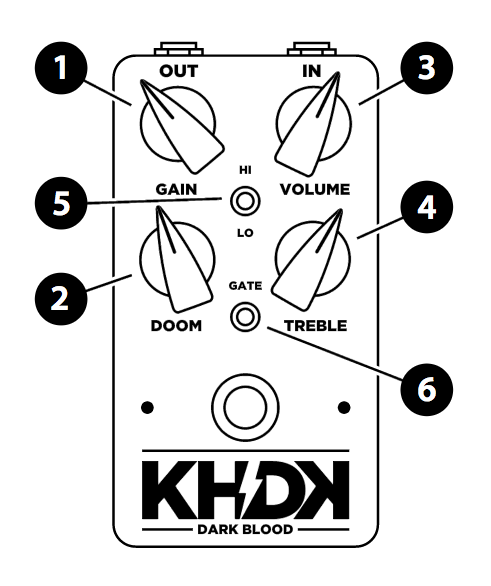 Like all KHDK pedals, Dark Blood is proudly handcrafted and quality-tested in Kentucky, USA. GAIN controls the gain of the circuit. A lower setting creates a pick-sensitive tone with excellent dynamics, while a higher setting brings a massively overdriven tone. DOOM controls the pre-distortion equalization which determines the amount of low-end grunt present in your tone. This control moves from a tight bass to a long sustain, giving you a liquid, solo-ready tone. VOLUME sets the output volume of the pedal. TREBLE control is a passive, natural sounding low-pass filter. It cuts high end and offers a wide frequency range. Turned clockwise, it becomes raw, aggressive and cuts through. Turned counterclockwise, it cuts highs for a warmer and more mellow tone. With different amps, the tone can be bright or dark; use this control to set the ideal amount of brightness/top end. The HI/LO switch is tied directly into the gain. The lo setting offers a massive chunky overdrive, great for rhythm playing. The hi setting adds more saturation, sustain, low end and compression. This setting is recommended for soloing. GATE controls the background noise of your tone. This allows the stronger gain signal to pass, while weaker humming or hissing is blocked. Turn the gate clockwise for noise reduction, but avoid pushing the gate with lower gain settings; this could negatively impact the decay of your tone. FOOTSWITCH engages your Dark Blood to “on” or True bypass mode. Dark Blood is powered by a single 9V battery. You can access the battery connection by unscrewing the bottom plate of the pedal enclosure. Alternatively, plug in an external 9V DC (center negative) power supply. Power Input: Standard 9V Battery or 9V DC (center negative) power supply.